Vokalisten elsker metal, det er det ingen tvil om. Tittelkuttet har vært ute i videoform i noen uker, og med det er flere av skivas spor tilgjengelig. Siste smakebit jeg legger ut før skiva kommer. Og det er bare en uke til. Ny video fra Dee Snider. Skive kommer i slutten av måneden. Snider slipper som kjent skive i juli, her er litt info. Utover det jeg meldte inn før helga, foreligger coveret og tracklisten, og et par uttalelser. Dee: "I am beyond excited to be working with one of the world’s leading labels (Napalm Records - Yj) for heavy music, it’s a perfect home for this album! I believe there’s something for every hard rock and metal fan on this record and I cannot wait to unleash it on the world July 27th!" Jamey Jasta: "I’m so happy and proud to have been a part of this project, Dee Snider is an American original, there is no other voice like his on earth, his power and passion really shine through on this album. Metal brings us all together and with Dee still at the forefront, it’s a great time to be a fan of heavy music!" Howard Jones: "To be given the chance to write for AND sing with Dee Snider, one of the men responsible for shaping heavy music as it is today, is an absolute honor. The voice, the mind, the swagger...the man is one of a kind." Alissa White-Gluz: "I am honored and humbled to sing alongside such a truly unique and talented soul. I love that Dee Snider has continued to shock people for decades just by being himself. I can’t wait for everyone to hear our duet! It was no easy task matching up to Dee’s level of vocal prowess but I washappy to accept the challenge and I’m in love with the results!" Frontmannen slipper soloalbum i slutten av juli. Det er Napalm Records som informerer, og som forteller at de har knyttet til seg Dee Snider for et kommende soloalbum. Tittelen er 'For The Love Of Metal' og dukker opp 27. juli. 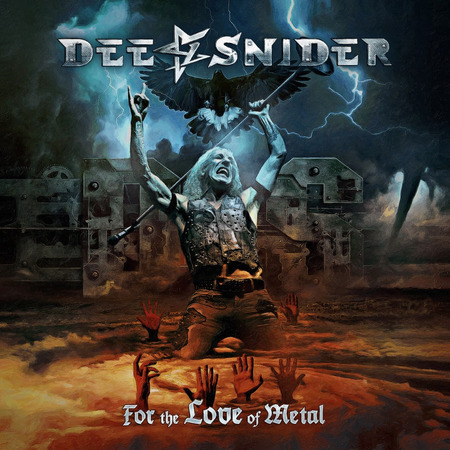 "Dee Snider doesn’t need any introduction anymore, right? Influential hard rock legend, reality TV star, Broadway alumni, horror movie director, radio host and as you all know – he is a thoroughbred heavy metal enthusiast." Albumet som kommer er produsert av Hatebreedvokalist Jamey Jasta, og teller gjesteopptredener fra "... Howard Jones (ex-Killswitch Engage), Mark Morton (Lamb Of God), Alissa White-Gluz (Arch Enemy), Joel Grind og Nick Bellmore (Toxic Holocaust), og Charlie Bellmore (Kingdom Of Sorrow). Dee: "I am beyond excited to be working with one of the world’s leading labels for heavy music, it’s a perfect home for this album! I believe there’s something for every hard rock and metal fan on this record and I cannot wait to unleash it on the world July 27th!"